Bluffton, South Carolina’s, finest BBQ! Traditional slow-cooked, pulled pork, smoked chickens, and premium baby-back ribs. BBQ Gourmet in a Take-Out Tray! Treat your guests to a delicious buffet with Pans of BBQ and delicious sides. Known to many locals as the best BBQ in the South Carolina Low Country, the “Choo Choo” offers traditional oak wood smoked, slow-cooked, pulled pork, chicken and baby back ribs. The BBQ Sauce is an exclusive recipe to ‘top off’ your unique BBQ dining experience. From 11am-4pm, Any sandwich comes with two sides and a drink for $10. A short distance from Highway 278, the gateway to Hilton Head Island. Choo Choo BBQ has long maintained its reputation as being one of the best purveyors of traditional BBQ anywhere! 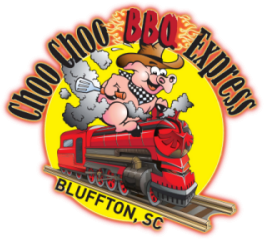 Choo Choo BBQ Xpress has indoor/outdoor seating, take-out, and Party Pans for your events. Barbecues have been a White House tradition since Jefferson. Lyndon B. Johnson hosted the first barbecue at the White House that featured Texas-style barbecued ribs. Jimmy and Rosalyn Carter hosted a “pig pickin’” for about 500 guests including visiting foreign dignitaries. Ronald and Nancy Reagan also were avid barbecuers who entertained with barbecues at their ranch. George H. Bush held a barbecue for Members of Congress annually on the South Lawn of the White House, a tradition continued by his son, President George W. Bush. However, that tradition was interrupted on September 12, 2001, the day after the terrorist attacks on the World Trade Center and the Pentagon. Secret Service agents, who had evacuated the White House a day earlier, cancelled the barbecue and the White House kitchen released 700 pounds of beef tenderloin to feed the hundreds of rescue workers who had traveled to Washington.